Villa Poppy is a great choice if you don't want to drive on your holiday. 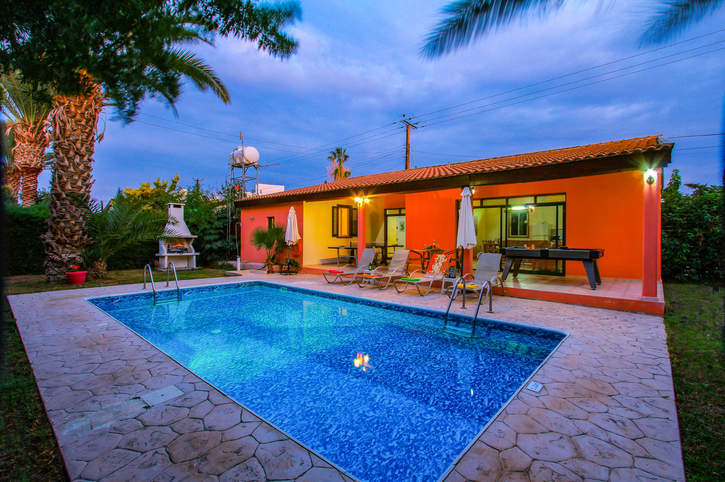 This delightful 2 bedroom villa is located within walking distance to Polis Beach and the main square meaning you'll have a good number of shops, bars and local tavernas within easy reach. The villa is spacious inside and out, plus it has a mature garden making it the perfect choice for a relaxing holiday. Pool heating, air conditioning/heating in the bedrooms and WiFi are included. The traditional and charming square of Polis and the beach are just a short stroll away. Love it! The private swimming pool is surrounded by garden on three sides ensuring a good degree of privacy. There is a shaded raised terrace housing the games tables. Adjacent is a brick BBQ and a table and chairs for 4 people - perfect for alfresco dining. There is a parking at the side of the villa. A few steps from the street leads to the front door. The open plan living area is spacious and has a comfortable seating area, a flat screen TV, a dining table and chairs, and well-equipped kitchen. There is patio door leading to the covered raised terrace and private pool. The pine wood ceiling adds character to this room. There are 2 bedrooms - 1 double with an en suite shower room and a twin in this villa, plus a separate shower room. The bedrooms have a homely, traditional feel with wooden ceilings and terracotta flooring. Villa Poppy is centrally located in Polis. The bars, cafes and restaurants of the main square as well as the beach are just a short walk away. If you're after some seafood then Latchi Harbour is the place to be, 10 minutes' drive away. What's more you can hire a boat and explore the breath-taking Akamas Peninsular. Polis is the ideal holiday location for those who appreciate authenticity and seek a relaxing holiday. Our Villas Rosie, Ibiscus, Iriss and Clymentas are on the same cluster. Polis Square has several shops but the ambience itself still remains laid back, calm and relaxed. Alternatively, you can find more in Latchi, 10 minutes' drive away. There is a farmer's market in the old town of Paphos, where especially at the weekends you'll see locals out and about buying fruits and veggies. If you are after some retail therapy the Kings Avenue Mall in Paphos has many shops. Polis is an authentic little town away from the hustle and bustle of the more well-known resorts. It has a good selection of bars and restaurants just a 10 minutes' walk from Villa Poppy. Alternatively, a short drive away is the slow-paced fishing resort of Latchi with excellent fish tavernas. Polis Beach is 10 minutes' walk away. This shingle beach has sunbeds and parasols to hire. Or, if you travel west along the coast, there is Latchi Beach, 10 minutes' drive away. There is go karting on the outskirts of Polis. Or, the horse riding in Lysos is great for a family day out and is just a short car ride away. You also can try water sports at Latchi Beach or just shop for local souvenirs in Polis Square. North-east of Polis are numerous villages. Argaka has a lovely picnic area adjacent to the beach and is a perfect way to spend a day relaxing in the shade of the trees. Pomos is a small fishing village with stunning sea and inland mountain views. The Tsada Golf course is just 25 minutes' drive away from Polis. Polis is considered as the great location for nature lovers and those keen on active holidays. It's great for hiking, cycling, horse riding and just generally exploring. Villa Poppy is not available to book for season as it is sold out. Take a look here at the Cyprus villas that are currently on sale. Fantastic villa - couldn't ask for much more! Overall villa excellent, we had areally enjoyable holiday. Our villa rep was most helpful & accommodating - a credit to Villa Plus! This was our first villa holiday and it was fantastic. The Polis area had all the facilities required eg restaurants/banks/pharmacy/supermarket and many more. This made our stay more relaxing and did not have to travel far so no car hire was required. The poppy villa was exactly as shown on the website and had everything needed for self catering. We would definately be booking with villaplus again. A brillant holiday. The kids enjoyed the freedom of the pool. The villa well equipped so we didnt have to leave it, everything was there you needed. The best holiday we have had. We both had a very enjoyable, relaxing holiday and we would definitely use Villa Plus again. A fantastic villa, holiday and country. We will definitely visit again! Lynne Melling was excellent. As stated in the villa description it really was walking distance to the nearest taverna. I will certainly use villa plus in the future. A brilliant relaxing holiday with everything you could wish for in the villa.